Winter Heating Costs Likely To Increase : The Two-Way The federal government says higher fuel prices and colder weather will add up to a steeper bill than last year for consumers heating their homes this winter. 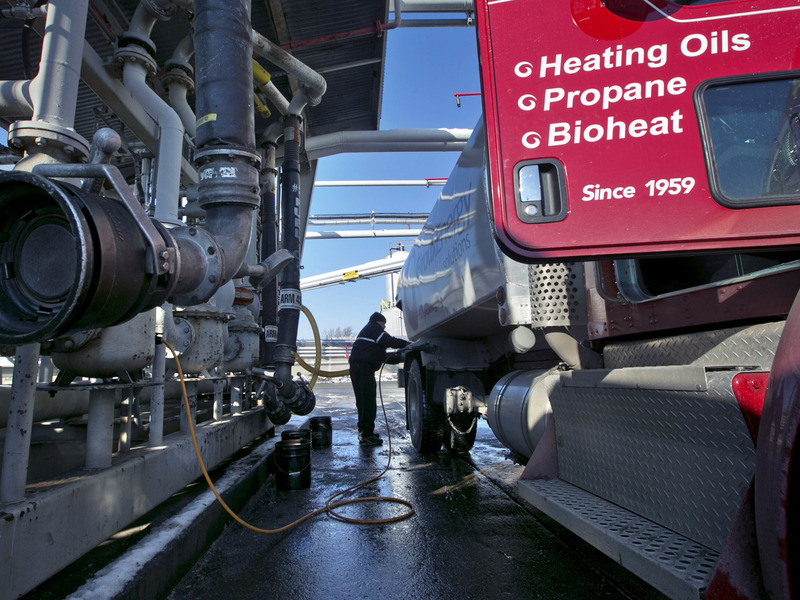 An oil company driver fills his truck at the Sprague terminal in South Portland, Maine, last winter. This winter, costs for heating with all fuels are expected to go up. You will likely pay more to heat your home this winter than you did last winter, the federal government says. The yearly winter fuels outlook report from the U.S. Energy Information Administration finds higher fuel prices and a colder weather forecast than last year will add up to an increase in heating costs. "The Energy Information Administration projects gas bills will rise more than 20 percent. Your overall bill will depend on where you live. The agency reports that an entire winter's worth of natural gas heating for the average home will be $635. "In the Northeast it will be nearly $900 [because] pipeline bottlenecks have pushed up prices in the region. Gas is still the cheapest fuel to heat with. Electricity costs about a third more [and] heating with oil or propane is expected to cost at least twice as much as natural gas this winter." The Energy Information Administration says natural gas is the most common space heating fuel in every region except the South, where electric heating is more prevalent, and that heating oil is much more common in the Northeast than in other regions. "Temperatures this winter, based on the most recent forecast of heating degree days (from the National Oceanic and Atmospheric Administration (NOAA), are expected to be much colder than last winter east of the Rocky Mountains, with the Northeast and Midwest 17 percent colder and the South 18 percent colder. ... In the West, temperatures are forecast to be about 2 percent warmer than last winter." However, to give you an idea of just how warm last winter was, the report notes that this winter is still expected to be about 3 percent warmer than the average of the five winters preceding last winter.